This blog post is the previous post part two. The day wasn't over yet after the dentist. That evening, the kids had their annual Primary Parade. They absolutely love this activity. I think Kaleb would love it more if he would learn to ride his bike. Kurtis came home a little bit early so he could put Kaleb's training wheels back on his bike. Oh, I suppose I need to tell you this part first. Last year, Kaleb randomly decided he wanted to learn to ride his bike sans training wheels, but every time he tried it, he would get freaked out and wouldn't even get on the bike. So this year, he yelled at me that he never told me he wanted his training wheels off and that I needed to put them back on. I'm not kidding. 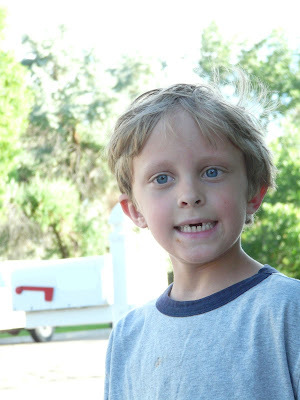 He yelled those words at me, "I DID NOT TELL YOU TO TAKE MY TRAINING WHEELS OFF!" Maybe he didn't. Maybe it was a mutual agreement. They weren't working very well and they kept flipping up and making him fall over and cry, so why not just take them off? Either way, he agreed to it. We got new training wheels that had a bar support, but Kaleb's bike doesn't have the right bar to hold the bar support in place (the bar support keeps the training wheels from flipping up, I don't know if that's what they are really called, but that's what I'm calling them. ), so the bar support couldn't do its job, and it flipped up and freaked Kaleb out. Sigh. Kurtis decided to duct tape the bar support to the bike's bars. It will all make sense when you see the picture. I'm not always very good at this. Any way, before Kurtis put the duct tape on, it was time for Kaleb to go meet at the Bishop's house to get ready for the parade, so he said, "I will just run in this parade!" Sassy. Zach and Riley were already gone and he didn't want to miss it. Honestly, because he was walking we didn't see him in the parade at all. I tried to get good shots of the kids, but man. Once they were off, it was over. The parade route went up our street and around the block and back to the commons for Popsicle. They love it. It's not all that spectacular for the parents to watch, but that's not what Primary is for. It's for the kids. And that makes it a great activity. After the activity, Kurtis helped Kaleb to get back on his bike. At first, he was nervous, but now he is taking off and getting used to going fast. I can't wait to go biking with him when he looses those training wheels. That's Zach on the right and his friend in the purple shirt, but I don't know who that is in the red shirt. This is the third year in a row we have had the Primary Parade. The other two years, the Bishop and his wife road a tandem bike, but she hated doing it. The Bishop would be in the front steering the bike and trying to wave to everyone at the same time which would freak out his wife because if he's waving to everyone, he's not steering the bike and she was worried they were going to hit somebody or fall over. So they borrowed this from their son, and squirted people with a water gun and threw bubble gum at us as they went by. Oh, Riley is correcting me. They were not Popsicles. They were Otter*pops. Sorry. A little nervous at first. Look at the duct tape on his bike. It's by the word RacerX. That's hilarious. They let the balloons go. I love this picture. It's such a great father/son moment. 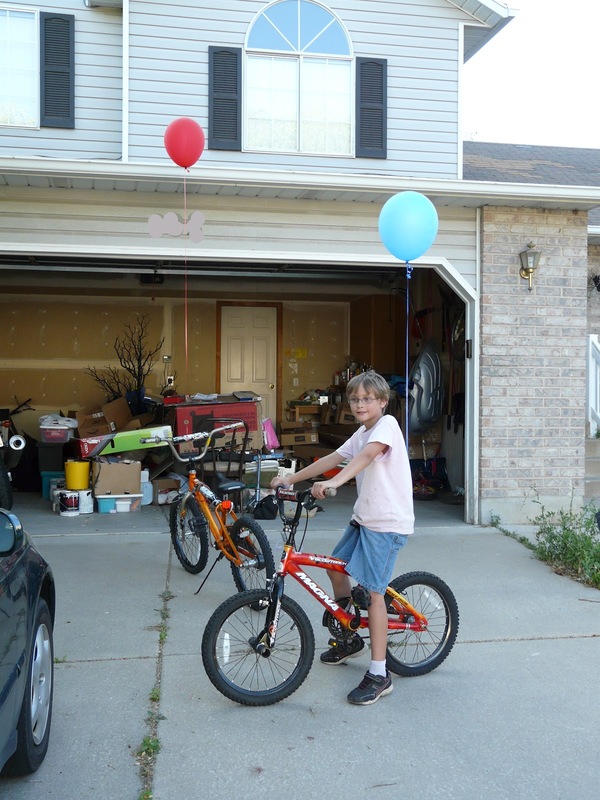 Zach wanted to cut his balloon off his bike in dramatic fashion, but it was cut short. Ha ha! I'm so punny. He did get it off, though. Bishop took my kids for a ride! And then squirted me with the squirt gun! Ha ha! I'll Color On Them All! Where Does My Poop Go?